As I mentioned recently in this post, we are hoping to crack on with our loft conversion very shortly, or as it’s affectionately called here #ProjectAttic. We’ll be turning the space into a bedroom and en-suite for me and the husband to move into, so I’ve been giving some thought to the kind of look I want it to have. I find that quite hard when I haven’t even seen the space. All I’ve got to go on is the plans and my imagination, and as I know from past experience, I tend to think the space is much larger than it really is. Do you do this? I have trouble keeping the dimensions of a space real or true in my head and I always imagine them larger than they are in reality. I’m just not very good at it. So, if I’m choosing furniture I often need to be in the room and measuring it out on the floor. Otherwise I tend to think I’ll fit in 3 sofas, a majestic coffee table and bookcase, when in reality it’s one sofa and a side table! I think my brain adjusts the space to fit my dream purchases. So, I’m not going to buy anything until the room is created and I know exactly what space we have to play with. 1. From FADS I’m liking the retro curved feel of this chest of drawers, and the added bonus of the mirror and side cupboard is a great design feature. I’m not sure we’ll have space for a chest of drawers just yet, but I was looking for bedside tables (see no. 5 below) and then noticed this matching piece. 2. The bed is the main piece I’m looking for at the moment. This is the more contemporary addition to the look, in that it’s grey fabric base fits the bill perfectly, although I’m not sure if the headboard on this one is too high for the space we’ll have. Again, I need to see a finished space before I can be sure. This one is from FADS too and even comes in an ottoman version with added storage. 3. Do I want/ need wallpaper? Not sure I do really, but whilst browsing the lovely Rockett St. George site I saw this fab Mr Perswall wall mural which has the right mix of contemporary and industrial for my look, so had to include it here. 4. The dressing table has to be just right (and doesn’t necessarily have to match the rest of the bedroom furniture) and I’ve had my eye on this one from Habitat for a while. I love the contemporary/retro feel of the design plus the dainty drawer knobs. In pale birch it works well with the grey fabric bed and light oak bedside tables. 5. Yes, the lovely Amy Oak bedside tables from FADS had me hooked as soon as I saw them. As much as I’d love some dip-dye legged table, they won’t offer enough storage for the bedside clutter we seem to accumulate, so we do need some drawers. These could be perfect! 6. The lighting is the area I want to bring in some of the industrial look. Integrated wall lights like these little beauties from Rocket St. George are gorgeous and exactly what I’m looking for. I’m finding it so hard to resist buying them already. 7. Finally, the Phillipe Starck Ghost chair is the perfect accessory for my dressing table area. I’ve fancied one of these for ages, and have spotted this one on eBay. Again trying to resist for a little longer, but finding it so hard! I know it’s a bit of a mixed bag, but do you think it could work? Obviously there will be more colour (I’m thinking inky blue) but these are the basics. 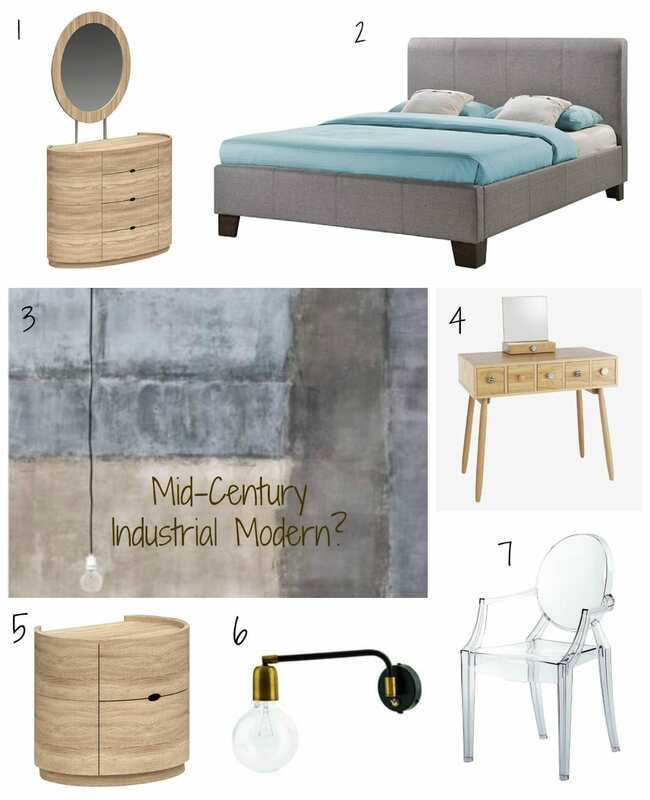 Would love to know if you think I can pull of this new Mid-Century Industrial Modern look. Previous Post Are Desk Lamps Good or Bad for your Eyes? That looks really nice. Definitely it’s a good idea to wait until you can measure up the space properly! In the meantime you can play with ideas and designs! a loft conversion is on our ‘to do’ list!